For this tag you'll want the beautiful art by Tatyana Haustova, which you can find and purchase at Artistically Inclined Licensing- http://artisticallyinclinedlicensing.com/AIL/. 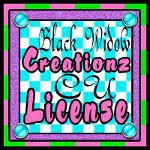 You will also need a license to use this art, and display it within your creation. 2. Right click on "rounded rectangle2" in layers box, ALPHA TO SELECTION then left click on paper 4 layer in layers box to activate it. Go up to SELECT>INVERT and then EDIT>CLEAR. Now this paper is the template layer so you may delete the original template layer. Next, R click on "Raster 2 #1" ALPHA TO SELECTION, make paper 5 copy the active layer then up to SELECT>INVERT, EDIT>CLEAR. Delete original template layer. R click on "rounded rectangle3" ALPHA TO SELECTION, make paper 5 the active layer then up to SELECT>INVERT, EDIT>CLEAR. Delete original template layer. With one of the copies of Paper 8, go up to COLOR>INVERT to make it black... now repeat above steps with this paper and layer "rounded rectangle." And with the white/original paper 8, repeat above steps for this paper and layer "rectangle" all that now should be left of the original template is frame and frame back layers, well with the copy of paper 8, repeat the steps above to make it the layer called frame. 3. Add the tube of choice, this one comes with several hearts and roses as well as a frame. I deleted all layers but the full body, close up and roses2 layer. Duplicate the close up but make the copy invisible for a moment, we'll work with that next. For now, position the close up above the frame back layer. Then right click on frame back and ALPHA TO SELECTION then SELECT INVERT, EDIT CLEAR. Go up to FILTERS>ARTISTIC and choose Softglow, using the settings shown below and hit OK. Element 2- 379 x 346, place the close up of tube behind, click fuzzy select tool in frame, SELECT>GROW by 2 then left click on tube layer to activate and LAYER>CROP TO SELECTION. Apply softglow filter as before with same settings to the tube layer. 5. Back to paper 3, move to bottom of layers box, then drag and drop mask "MisfitsChoiceMask2" from GP folder, scale down to 700 x 700 then LAYER>ROTATE by 90 degrees. COLOR>INVERT then LAYER>TRANSPARENCY>COLOR TO ALPHA. Right click on this layer in layers box ALPHA TO SELECTION then L click on paper layer to activate it, go to SELECT>INVERT and EDIT CLEAR. The paper is now the mask layer. you may delete original. 6. Place full body tube in middle of tag, add drop shadow of 8/8/15. Add the correct copyright to tag, include copyright symbol, artist's name, website, and license number if applicable. Hope you liked this tut!